It is spring and the farmers market is starting to showcase beautiful flavorful tomatoes. I love pasta, and when I see tomatoes it is the first thing I think of making. This is a meal that you can make in about 15 minutes. Here is how to do it. Meanwhile, chop up tomatoes. About 6 medium sized. Heat a pan and add 2 Tbsp. of olive oil. Add 2 cloves of minced garlic. If you like some heat, now is the time to add a pinch of red pepper flakes. Add the spelt * pasta to the water. Add the tomatoes with their juices to the pan with the garlic. And red pepper flakes. Cook the pasta according to package directions. Just before the pasta is done, add a handful of basil to the sauce. Drain the pasta and pour it into the pan with the tomatoes. * Stir and cook for about one minute. Notes* you can purchase spelt flour at your local health food store or online. I also always save a cup of water when I drain my pasta. I always use a little to add to my sauce. It brings it all together. Here is the quick and very easy dinner I made last night. Within an hour it can be on your plate. Preheat your oven to 425 degrees . Scrub and wash a sweet potato or a yam. Poke with a fork or knife so steam can escape. Put it on a cookie sheet and bake for one hour. 45 minutes into the cooking, place the broccoli in a steamer. Place the salmon in a baking dish. Sprinkle with a little salt and pepper. Squeeze a few teaspoons of fresh lemon juice on top. Steam the broccoli and bake the fish. The fish should be done in 12-15 minutes. Tip. Zest the lemon and sprinkle on the broccoli. It gives it a great punch of lemon flavor. Salmon, rice and salad I went to dinner at a friends house. As a favor to me this was a more alkaline meal. Roasted Salmon, Japonica rice, cooked in vegetable broth with onions and salad filled with healthy greens, steamed broccoli and tomatoes with a dressing of olive oil and fresh lemon juice. If you keep the protein to a 4 ounce portion(acidic) and combine it with alkaline foods, the rice and salad, it is possible to enjoy most foods you enjoy and still be eating alkaline. Pasta is a go to quick meal. Serve it with a tossed green salad and you have dinner in under 30 minutes. Add one box of spelt pasta or try quinoa pasta. Heat a frying pan, add the onion, cook for 3 minutes. Add the zucchini cook for 5 minutes. Season with salt and pepper. Drain the pasta and add to the pan stir in the fresh herbs. When my kids were little I would mix vegegetables into red pasta sauce to hide them. Now I can just put them on top. The early girl tomatoes are in the farmers market right now and they will not be around too much longer. I just love the punch in their flavor. I made this pasta and got a little creative with the garnish of zucchini. It’s a fun presentation and the zucchini folds into the pasta. Heat a saucepan with 2 tablespoons of olive oil. Cut up 12 early girl red tomatoes, add to the pan. Mince 1-2 cloves of garlic. Add right on top of the tomatoes. Cook for 10 minutes, using a fork, occasionally smash the tomatoes. If the sauce is too thick, add a spoonful of the pasta water. Using a vegetable peeler, peel the zucchini unto long strips. Drop Into the boiling water for 1 minute. Remove from the pan, cover and set aside. Add the pasta to the water and cook according to package directions. When the pasta is done, drain, and put in the pan with the sauce. Add the basil and stir. Place the pasta into individual bowls and put a portion of the zucchini on top. The farmers market had some beautiful squash last week and I got inspired to create a quick ratatouille. You can make this in under an hour and it will grace your table. Put this on your table and there will be nothing left in the pot when you clear the table. This is a side dish that goes with almost anything. It can be a main course if you serve it with a bowl of quinoa. Slice the eggplant and sprinkle salt over the slices. Set in a bowl for ½ hour. Wipe the salt off the eggplant and cut into I inch squares. Set aside. Heat the olive oil in a large pot. Add the onion and cook about 5 minutes. Add the garlic, eggplant, squashes and the tomatoes. Stir, add the oregano and a little salt and pepper. Cook over a low heat for 45 minutes to an hour. Note: if you have fresh sweet and delicious tomatoes, you can use them instead of the canned ones. About 1/12 cups fresh chopped tomatoes. This is a very easy dinner to prepare and you can make it in about 15 minutes. Add a tossed green salad and you have an alkaline meal. Heat a grill pan, place the potatoes in a pot with salted cold water. Bring to a boil, lower the heat and simmer for 12 minutes. Meanwhile, season the fish with a little salt and pepper. Place the fish on the grill and cook for 12 minutes. Add the broccoli to the potatoes and cook for 3 minutes. Drain the potatoes and broccoli . Take the fish off the grill. I love to start off my day with a cup of ginger tea. I prefer to use fresh organic ginger. It is so delicious and easy to make. It is also known to have strong anti inflammation properties. I start by peeling the ginger, then I cut a few slices off and put them in a cup of boiling water. Let steep for just a few miutes and then it’s time to enjoy the wonderful taste of fresh ginger tea. Slice a papaya in half. Remove the seeds. Squeeze on little lime juice. Add about ½ cup of sliced strawberries. A small handful of almonds complete this meal. This is also a perfect afternoon snack. Heat the butter a small frying pan. Add the onions. Sauté about 5 minutes. Salt the potato and form into a round patty in the pan. Cook about 4 minutes and flip to the other side. Crack an egg and place on the potato patty. Cover, and cook 3-4 minutes. Swordfish with mashed cauliflower, broccoli and japonica rice. Make the cauliflower first. Break down the cauliflower into medium sized florets. Place on a steaming rack in a pan with water. Steam about 10-12 minutes. Transfer cauliflower to a blender. Purée, use the stock to get a creamy consistency as if you were making mashed potatoes. Add the ½ cup stock slowly as you might not need all of it. Season with salt and a little white pepper . Set aside. Note: you can make this hours before dinner and It reheats easily. Make the rice in a rice cooker or according to package directions. until they have softened. Stir in the rice. Season with salt and pepper. Transfer to a rice cooker. Add the stock, cover and cook. The rice timer will tell you when it’s done, about 40 minutes. This can also be made early in the day and reheated. Place a steam rack in a pot, add water to come up just under the rack. Add the broccoli and steam about 6-8 minutes to desired doneness. This fish is easy to grill. I used my grill pan on my stove. Heat the grill pan. Put a little olive oil on a paper towel and gently apply it to the grill pan. Season the fish with a little salt and pepper. Place the fish on an angle to get good grill marks. Let the fish cook about 6 minutes, do not touch it. Then turn it over and cook about two minutes. Remove from the grill, transfer to a serving plate, garnish with a fresh lemon. I was taking a walk with a friend and when we were saying goodbye she asked me to come in and help her make a pot of soup. We did start the soup, but there was so much left over that we prepared a dinner for her and her husband. She sent me this picture. 2 bell peppers, any color you like. We used red and orange. ½ of a cauliflower that we sliced. Line a sheet pan with parchment. Place the vegetables in a single layer and brush with the olive oil. Sprinkle on the Parmesan cheese, and season with a little salt and pepper. Place in a pan cover with stock and bring to a boil. Fluff up with a fork and add ½ tsp of salt. Pasta with sautéed vegetables. Serves 4. I had all of this prepped and ready to cook with the pasta. Using a vegetable peeler, peel the carrots and the zucchini in long thin slices. Set aside. Heat a large pot of salted water. Cook the pasta according to package directions. and the carrots. Cook for 2 more minutes Add half the stock, stir. Adjust seasoning. Mix in the pasta. add more stock if needed. Sprinkle with the cheese and some fresh basil or parsley. This is what the vegetables looked like before I added the to my pasta. 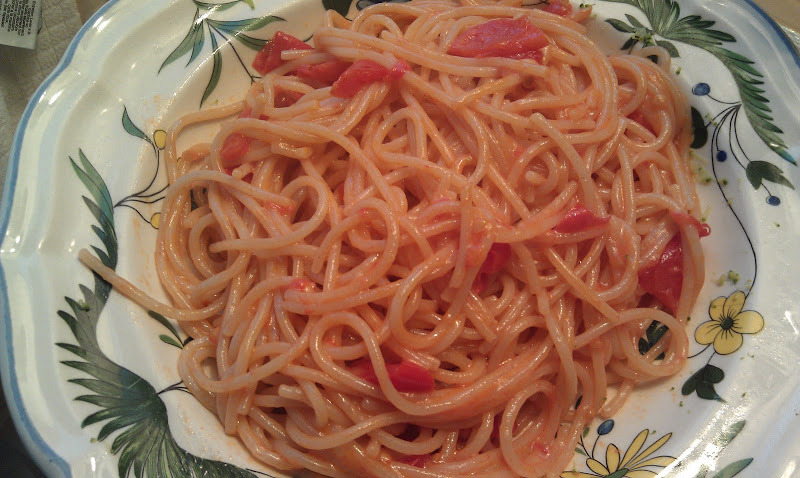 have been so sweet, I was inspired to create this simple pasta dish that stars the tomato. Quick easy pasta. Serves two. Bring a pot of salted water to boil. Add the pasta. Cook according to package. Meanwhile heat the olive oil in a frying pan. Add the onion and cook about five minutes. Season with ground pepper or you can add some red pepper flakes. The other night I got inspired with all of the fresh vegetables I purchased at the farmer’s market. 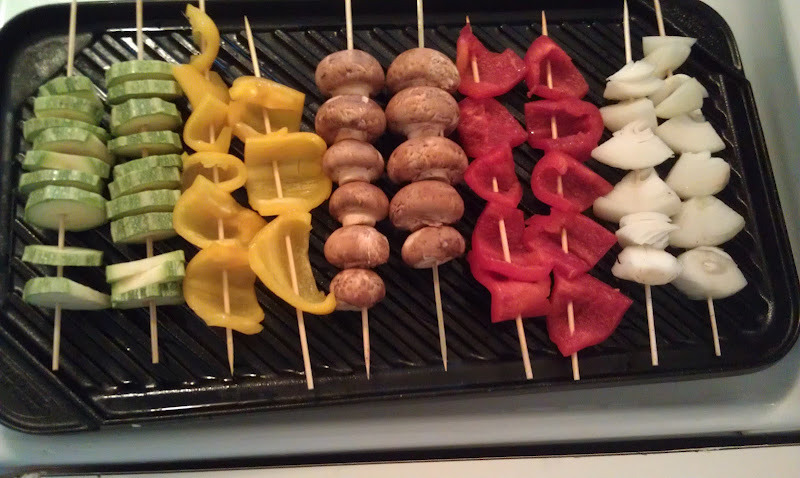 Putting food on skewers is an easy and fun presentation. I used zucchini squash, yellow pepper, mushrooms, red bell pepper and onions. I place the grill pan over my stove. It is important to preheat your grill for the best results. It is also a good idea to soak your skewers in water for a few minutes before using them. This prevents them from burning. The vegetables should take about 15-20 minutes to cook. I brushed them with a little olive oil. Here is the finished dish. I added a few skewers. of fresh salmon. To finish off the zucchini, I took them off the stick and placed them directly on the grill. I served this with a pot of brown rice and it was a big hit.